Best pacific ocean view from where we observe whales, birds and surf. Architect designed Bungalows with art collection, terraces and hammocks to relax and enjoy natural envoirment. Excellent hot water service and continental breakfast to start the day. 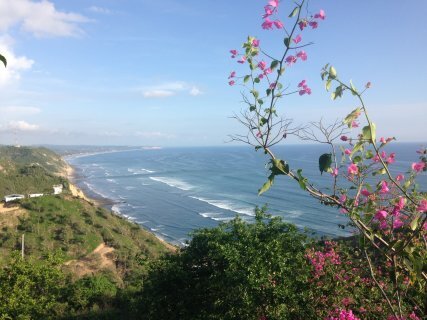 Walking distance surf and great location to reach other points and beach brakes. 20 km from noisy Montañita´s town and point. Located over a hill above little fisherman´s town with best Pacific ocean view. We provide Airport Transfers from and to Guayaquil and they can be booked in the booking steps. Bilingual birding and surfing guide. Know´s well the area and works for the protection of natural envoirments as well as the local culture.